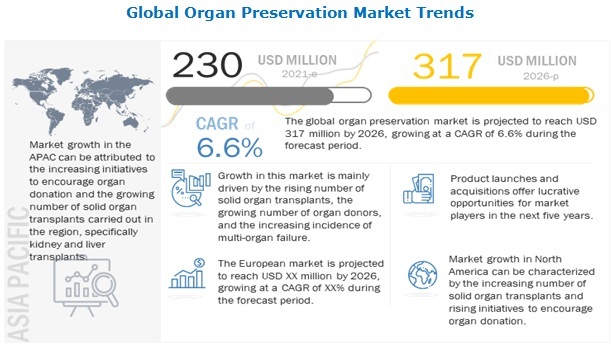 The organ preservation market is poised to reach USD 241.2 Million by 2021, growing at a CAGR of 7.8%, during the forecast period of 2016 to 2021. The growth of the overall market can be contributed to rising multi-organ failure cases in aging population, technological advancements, increasing government initiatives to promote organ donation and rising number of solid-organ transplant procedures. In the coming years, the market is expected to witness the highest growth rate in the Asia-Pacific region. North America is expected to account for the largest share of the global market. However, high cost of transplantation is likely to restrain the growth of the market during the forecast period. The report segments the organ preservation market based on preservation solution, technique and organ type. The University of Wisconsin solution segment is expected to account for the largest share of the market, by preservation solution in 2016 and is expected to grow at highest CAGR. This large share can be attributed to its prolific usage in the storage of kidney, liver, and pancreas, better transplantation outcomes, less histological damage, and improved physiological function of organs. The static cold storage segment is expected to account for the largest share of the organ preservation market, by technique in 2016 and hypothermic machine perfusion is expected to grow at highest CAGR. The growth of hypothermic machine perfusion can be attributed to factors such as better long-term graft survival rates, decreased vasospasm, and ability to provide metabolic support. Kidney is expected to account for the largest share of the organ preservation market, by organ type in 2016 and is expected to grow at highest CAGR. The growth of this segment can be attributed to factors such as rising cases of kidney failure, improvements in graft survival, and long-term graft function. The major players in the organ preservation market include Organ Recovery Systems (U.S.), Xvivo Perfusion AB (Sweden), Essential Pharmaceuticals (U.S.), Dr. Franz Kohler Chemie GmbH (Germany), and Waters Medical Systems LLC (U.S.), among others. The organ preservation market is expected to reach USD 241.2 Million in 2021 from USD 165.9 Million in 2016 at a CAGR of 7.8%. The demand for organ preservation solutions and transport devices has been on the rise due to the growing organ transplants across the globe and better transplant outcomes for end-stage diseases. The technological advancements in the organ preservation technique have enabled better transplant outcomes and spurred the demand for preservation solutions and transport devices for transplantation. 9.2.1.2 Growing Cases of Kidney Failure in the U.S.
11.3 21st Century Medicine Inc.